This deck by Archadeck of Greater Atlanta could even put Scrooge in the holiday mood. In many parts of the country a deck is an outdoor structure that can be enjoyed year round. With mild climates and the prospect of an “Indian summer” coming to call, homeowners in many areas of the country can enjoy the holidays outside just as easily as within the confines of their home. Taking advantage of crisp, fresh air and the true sights and sound of the season are a privilege to experience. Watching squirrels gather nuts and berries, feeling the wind blow through a majestic southern live oak tree and tickle your senses and even the smell of a cedar growing close by can all be enjoyed from the ultimate vantage point, atop your custom-built deck by Archadeck. These Atlanta homeowners are doing just that from their new deck that is truly a deck for all seasons. This Christmas deck is courtesy of the talents of Jeff Mullins and Sol Elisha of Archadeck of Greater Atlanta. This stunning deck is all decked out for the holidays in style. A scene like this gives new meaning to the old saying that there is no place like home for the holidays! This stunning multi-level diagonally installed composite deck has separate areas for lounging, eating or dining, and entertaining. The addition of recessed lighting carefully integrated into the staircases design ensures safe passage from one level of this stunning deck to another, and promotes an essence of romanticism as well. 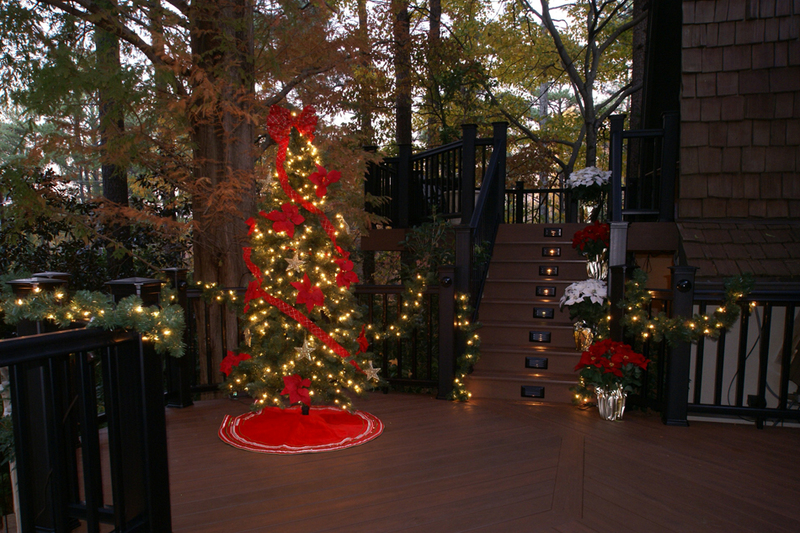 This gorgeous deck by Archadeck of Greater Atlanta is made even more stunning with adornments that signify the holidays. 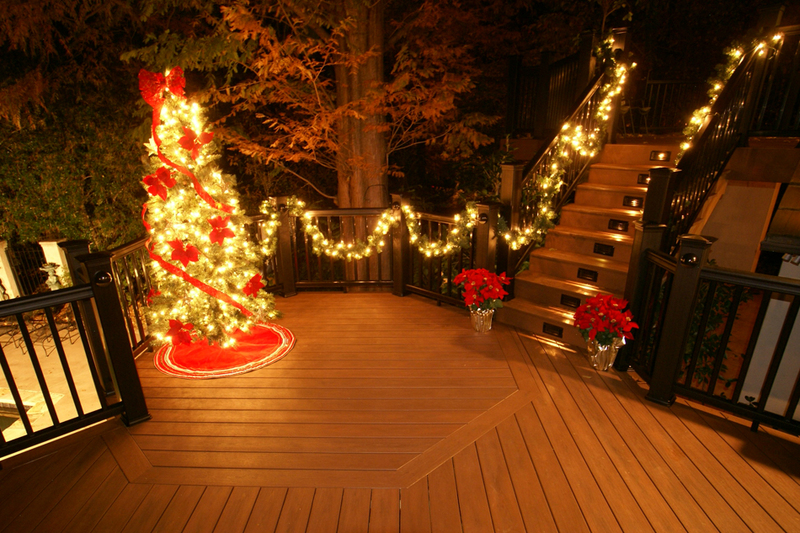 This already breathtaking deck has been make even more so by being decorated for the holidays. Can you imagine peering out your window on Christmas Eve and seeing this welcoming design of Christmas decorations and lights upon your deck? The homeowners creativity and talents really shine through. I don’t believe Ole’ St. Nick could have pulled it off better himself. The entire creation sets the stage for a perfect spot to make holiday magic come true and is also a spot to create lasting holiday memories. Archadeck specializes in designing and building many other genres of outdoor structures, including stunning and versatile decks. Can you imagine a covered patio used as an extension of your living and entertaining space complete with an outdoor fireplace integrated into the design? You could even top off the season with stockings hung with care by your outdoor fireplace, or maybe adorn the structures interior with whimsical Christmas decorations and lights. Remember that Santa doesn’t mind coming to call in your exterior room when it is all decked out in style for the holidays to welcome his arrival. Archadeck also makes the perfect gift this season. A new deck, patio or pergola is the gift that keeps on giving all year through. What could be more amazing than receiving a gift that offers years of outdoor living enjoyment? 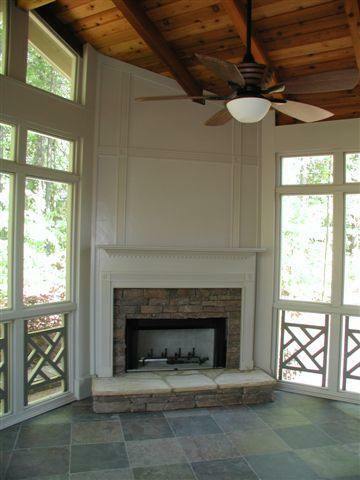 Can you imagine the holiday possibilities within this screened porch complete with an outdoor fireplace? To learn more about laying the foundations of creating your own “Christmas deck” much like the ones you see here, or to give the ultimate gift this year. Contact the deck and outdoor living experts at Archadeck. Give yourself and your family the gift of a deck this Christmas, and next year you can stage a scene that will remind you of the magic and beauty of the holidays. To find an Archadeck location near you visit our locations list, located on our website. This entry was posted in Archadeck, Composite Deck, Composite materials, deck Design, Deck Information, decking stairs, Decks, Fire Pits, Home Decoration, House Parties, Multi-level decks, Multi-season rooms, Open Porches, Outdoor Decorating, Outdoor Entertainment, Outdoor Fireplace, Outdoor Living, Outdoor Parties, Outdoor Room, Patio cover, Patios, Porches, Screened porch, Screened porches, Stairs and tagged archadeck, Arhcadeck of Greater Atlanta, Covered patios by Archadeck, deck builder, Deck Information, deck services, decks, decorating, decorating ideas, Decorating ideas for outdoor structures, decoration, family parties, Holiday decks, Holiday decorating ideas for your deck, Holiday decorating ideas for your outdoor structure, Home Decoration, home improvement, outdoor decorating ideas, outdoor fireplace, Outdoor fireplaces, outdoors, outdoors outdoor living, parties, The Christmas deck by archadeck. Bookmark the permalink.